I had originally expected to see Vic and Bob bring their silver jubilee tour to Glasgow 12 months ago, but the tour was cancelled when Bob Mortimer required emergency heart surgery just before the tour headed out on the road. Looking slimmer and fitter, they managed to keep their Glasgow date a year late. This gives me an excuse to recall the time a group of friends bumped into Vic Reeves in a bar in Glasgow about 20 years ago. A woman I worked with must have totally bamboozled him by telling him "You're no Jim Reeves, my mum has all his records and he died in a plane crash". It is 25 years (well 26 years now I suppose) since Vic Reeves Big Night Out started on Channel 4, bringing Vic and Bob to the nations attention and several other shows followed, including leftfield quiz show Shooting Stars. Their stage show isn't rammed with new material, except for the prolonged improvised sections which must change night to night, but is a nostalgic re-visiting of many of their characters from those shows. The characters they played out were always out-of-time so haven't dated, absurd versions of 1970s television staples from folk singers to talent shows and Crown Court. The stage features nothing more than a couple of chairs and a desk. Whilst the pair change costume brief sketches are projected onto a large screen at the back of the stage, such as adverts for "Geordie Jeans, so tight you can almost see your bowel movements". 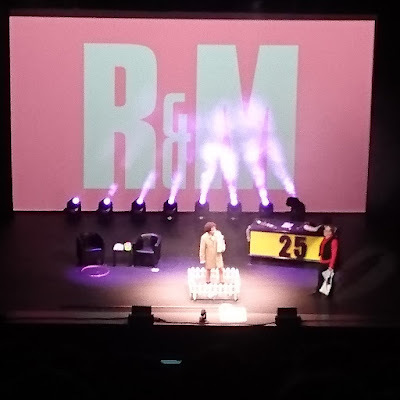 The audience was a mix of complete uber-fans who whoop along as they recognise every gag and song, those mildly tickled by the surreal nonsense evolving on stage and lanky teens brought along to observe their parents adulation of Vic and Bob's act. In a two hour show few old characters are omitted. The Man With The Stick, complete with paper helmet, Graham Lister appearing on Novelty Island talent show, Davey and Donald Stott, Mulligan and O'Hare and Judge Nutmeg. Catchphrases zip about and pan pipes of shoes, blows from mighty frying pans and thigh rubbing all feature as you would hope. Listing what is in the show, now of it makes any sense, but that really is the whole point, their enthusiastic acceptance that everything they are saying and doing is perfectly logical bowls you along. Some characters, such as Dr Shakamoto's funny foreigner who can't say English words properly, maybe are past their best. Others, such as the Terry Gilliam-esque naked, flying Henry VIII should be given their own series. A fabulous evening. Worth seeing just to see lard shoved through the nostrils of a photo of Benadict Cumberbatch and to be in the presence of the "dove from above". Here's to another 25 years of stuff from the surrealist's edition of Eric and Ernie.